The city is often seen as an ideal model of collective aspirations that are manifested in complex urban landscapes. The fact that these landscapes are transforming rapidly is a foregone condition. Most of these transformations are embedded in relationships between the city and its inhabitants. There are many ways to begin to look at these relationships. Historically, the old city (inner city) has always been at the core of this rapid urbanization. As the second year of SAME-SAME project, the premise of this workshop (composed of students and teachers from Mumbai and Hangzhou) is to look at this core and attempt to re-trace its blurred periphery based on present day imaginations. 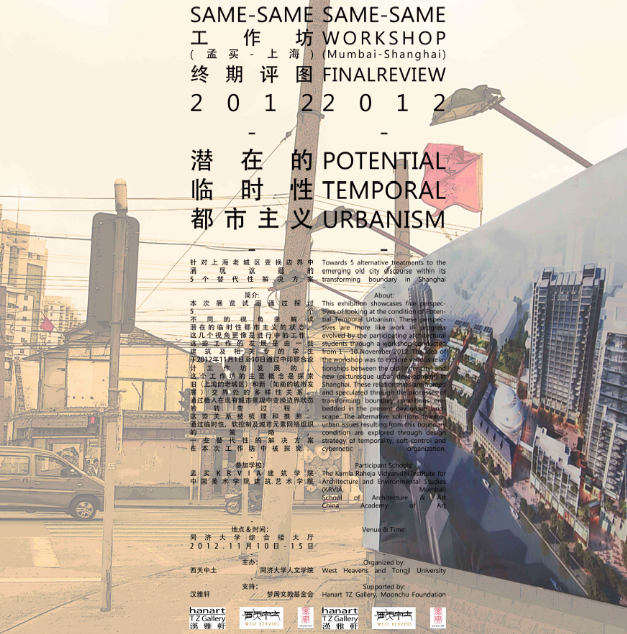 This workshop showcases five perspectives of looking at the condition of Potential Temporal Urbanism. These perspectives are more like work in progress evolved by the participating architectural students through a workshop conducted from 1 – 10 November 2012. The idea of the workshop was to explore various relationships between the old (inner city) and new (picturesque urban development) in Shanghai. These relationships are framed and speculated through the processes of transforming boundary conditions embedded in the present day urban landscape. The alternative solutions towards urban issues resulting from this boundary condition are explored through design strategy of temporality, soft-control and cybernetic organization. Team-1(Human perception – Sound): how the transforming boundary between old/new city developments produce sound and affect people living there? Team-2(Daily life - Alley): how the transforming boundary between old/new city developments excludes the activity within existing community alleys? Team-3(Building Typology – Shikumen): how the transforming boundary between old/new city developments changes the application of the “Shikumen” building typology? Team-4(People Flow – Corridor): how the transforming boundary between old/new city developments directs movements of people and activity? Team-5(Building erasure – Market): how the transforming boundary between old/new city developments requires temporal supply from the market? The premise of this workshop is to look at this core and attempt to re-trace its blurred periphery based on present day imaginations. Architecture and urban planning can be involved in the telling of stories about this core and its periphery. These stories could explore the spatial aspects of architectural and urban elements such as the relationship between a street and a pavement, between the built and the un-built between the old and new. These collected stories can then become the base narratives to re-construct smaller sites which then serve as context for designing interventions. The workshop would essentially consist of two stages. The first stage would involve site work and the second stage would be intensively studio based. The site work is constrained to begin within the inner city, which is presumed to be made up of a homogenous environment and move towards the peripheries of this environment till a point where there are apparent and non-apparent physical, social and economical transformations. · To choose smaller areas within the inner city (on a map) through random processes like bean mapping. · To document/record these areas through spatial experiences using non-textual mediums such as drawings, photography, film etc. To redraw/represent these using non-cartographic tools and conceptualizing them as possible sites for hypothetical design interventions. The idea of making un-conventional site models that are embedded with experiences could be explored. The workshop could begin on the first day with students and faculty exchanging introductions and information related to Shanghai (this could be in the form of informal discussion/presentation/lectures etc.). After this first session, we could schedule a brief visit to the old city for orientation. We could then form ten groups, each comprising of one Indian student and their Chinese counterparts. The ten sites could then be selected through dropping beans on a fairly large scaled map. On the next day we could start work on the site by dispersing the different groups to the co-ordinates identified earlier. A couple of days could be assigned for collecting site information, the method for which will be evolved by the students on site. Guided by collective spatial narratives, the sites could be assembled by juxtaposing desire with reality. Post this initial stage; we could have a studio session where all the documentation and information is shared with the whole group through brief informal presentations. This would become a critical juncture as it would set precedent for the next stage.